Visit Storm if you want to have some good food, innovative drinks and unadulterated fun with your buddies.Situated on a well connected running road, Storm is the perfect place to hangout… Seating is ample for parties and small meetups. However, now there are so many new eateries, that it’s difficult to keep a count. This area is also like, going through a revolution of sorts. Every nook and cranny of this market is witnessing the arrival of a new restaurant. On a lazy Saturday afternoon, we reached this place and I was pleased to see the cool atmospherics, as some great music played in the background. We were invited to “Storm” for a Bloggers meet at lunch . They had valet parking which was good. The ambience was nice and decent. Only thing I didn’t like much were the empty bottles kept on the walls haphazardly. You can put them in a better way or at least arrange them uniformly. To begin with, they had a special menu of some magical drinks and I tried some of them. My favorite was Fruit Punch which was filled with strawberries and sweetness. We ordered Mocktails – Italian Smooch which tasted good and Watermelon Charger which was pretty decent. Then came the Strawberry Banana smoothie which tasted like heaven with yummy taste of nutella. In starters we had mushroom duplex..Unique name isn’t it? It was so delish and was so droolworthy and full of spices that we just loved it. We had ginger chicken too,the moment I had digged in, it was love at first bite for me. Full marks to the dish. Also their main speciality is Crispy Dahi Kebab which was superblycooked and big in portion. These kebabs were soft and melted in our mouths. Then came Crispy papad paneer which seemed to as be crisp as the name suggests. It was finger style cottage cheese wrapped in papad and deepfried , it was mindblowing. We also ordered cigar rolls. They were stuffed with smoked malted cheese and mushroom with sweet chilli sauce. Fish orley was also nicel done served with tartare sauce. The thin crust Pizzas has a lovely smoky flavor and also the chicken verdes were nice. We also had Kotmir chicken tikka, it was a really brilliant dish and was cooked very nicely. The chicken had a smokey flavor and the flavour of spices and chillies was just bang on. Being a fish lover, I was very eager to try the grilled dish and I must say that it was worth the wait. The fish was so juicy and it just melted in my mouth within seconds. The veggies were really fresh and delicious. 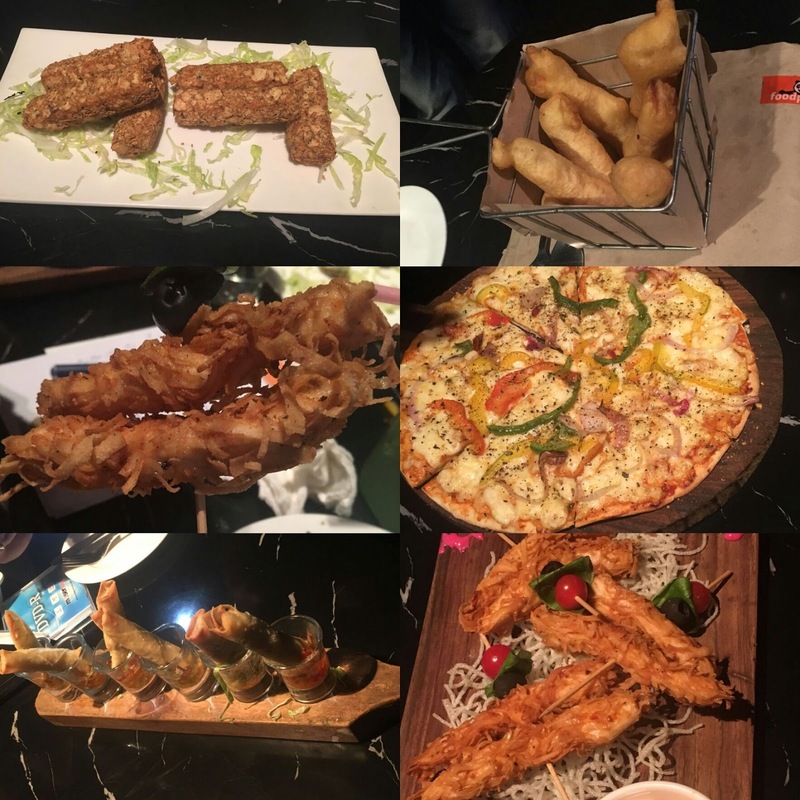 As we had such good variety of starters we were almost full, still we foodies cant resist and ordered 2-3 dishes for the main course. The Dal Storm, Butter chicken and Paneer lebabdar. Dal was good but the Butter chicken and Paneer resembled in gravies too much.Anyways , no regrets as we enjoyed our starters a lot. For desserts we ordered gulab jamun and they were juicy enough with rabri which was lip smacking. Storm fried ice cream was to die for! It was crispy ice cream ball served with honey and maple syrup. Then we had the Stormed signature tiramisu. Tiramisu, an Italian dessert which if not nailed by the chef turns into a disaster. I had some really high hopes from this Tiramisu and the moment i got a spoonful in my mouth, i went to a different galaxy. It literally got over in 2-3 minutes and was so delicious and heavenly. The restaurant proved it is indeed trying its best to server the best it can. My experience at Storm was really good. Service to food, quality to quantity, I enjoyed everything. A must go place.